Product labels are any piece of material attached to a product to identify it, or to a container to identify its contents. Information that is directly written on a product can also be considered a label. Product labels don’t necessarily contain information on the item, and may also include other information, including but not limited to the brand, manufacturer, and distributor. What are product labels made of? Product labels could be made of any material suitable for printing or writing product information. Most product labels for consumer items are printed on label stock made of paper or a polymer such as vinyl or biaxially oriented polypropylene film (BOPP). Paper is by far the most common material used for product labels. These labels can come in a variety of textures and finishes. Commercial paper labels are often coated with a thin plastic layer to afford some water resistance. Foil, fabric, latex, and plastic are other often-encountered stocks for modern product labels. Laminates containing a combination of these different materials are also common for contemporary labels. The choice of material is ideally matched to the application and expected usage of the products they are intended for. Any business that sells something needs product labels. 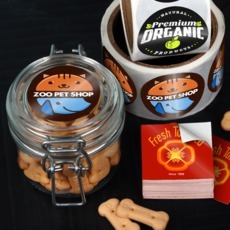 Labels allow items to be identified and are often the first point of contact between the customer and the product. This is the primary function of labels, allowing for items to be differentiated even if they belong to the same brand. Labels however, do more than just help identify items. Branding is a major function of labels, and a lot of the time invested in designing and creating them is related to this. How a product label is designed, created, and presented on the item can be crucial for spreading a brand and making the product more desirable. Product labels are important for identifying the brand, but they are also needed to give important details such as nutrition information, shelf-life, safe disposal methods, ingredients, or any other information as mandated. Depending on the item, the content of product labels may also be mandated by international standards. Special product warning labels distinct from the primary label may also be required by law or by industry standards on some items. How long should product labels last? A good product label must be able to stay on the product throughout its expected life. In the case of items with expiration dates such as food, medicine, and some chemicals, the label should be able to stay on well beyond the product's expected life to ensure both safety and efficacy. Product labels should also be able to resist conditions that a product or its packaging may be expected to encounter. Water bottle labels for example, may be subject to immersion in ice water or spend extended periods of time in a refrigerator or freezer. A food label in a resealable container may need some resistance to oil and corrosive ingredients that might be in the food, such as vinegar or citric acid. However, not all labels have to be extremely durable. Some product labels need to be easily removable so that the item may be used safely and effectively. This is the case for items such as appliances and cookware. Stickers intended for books and other paper products also tend to use weaker adhesives, to prevent damage upon removal. How do product labels adhere to surfaces? The vast majority of product labels today are attached to items by some form of adhesives. By far the most common categories of product label adhesives are heat activated or pressure-sensitive, similar to regular stickers. Most product labels use one or the other. However, these are not the only methods for attaching product labels to surfaces. Hang tags or swing tags can be used as product labels and are attached by twine, yarn, or safety pins. This gives a more interesting quirky look, suitable for more homespun brands. Fabric, plastic and polymer film labels can also sewn onto textiles. Classic paper labels often use some kind of wet glue or starch. Labels made from static cling materials require no additional adhesives and attach to surfaces thanks to static electricity, suction or surface tension. Labels can also be attached by other methods, including riveting, shrinkwrap, and pinning. These less common methods are often employed for economical reasons, such as the case with shrinkwrapped bottle labels employed by major brands, or to achieve a special look not possible with conventional methods. Are product labels different from stickers? Oftentimes, stickers can also be labels. Stickers don’t necessarily need to include any information at all on the item they are attached to, where a label always relies on another item to give it context and meaning. In day-to-day conversation however, they can often be interchanged. Did you find this useful? 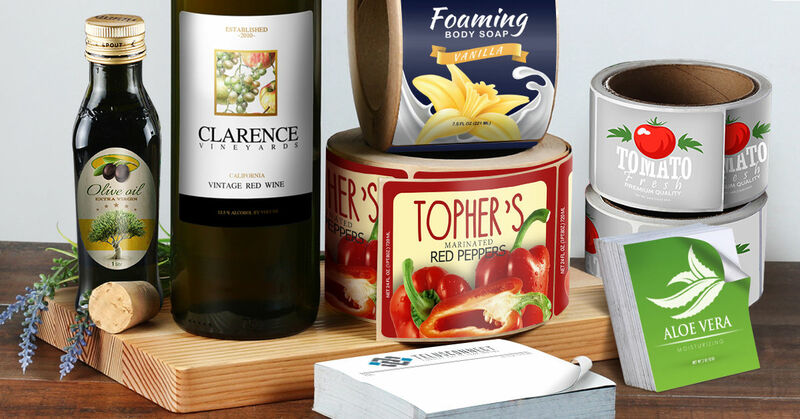 Print custom labels and choose from our many product labels here.